Great marketing is all about specificity. Being able to get the right message to the right audience – at just the right time – does more for successful conversions than just about any other advertising tactic. Targeting and timing are critical! With Sync2CRM, integrating CRM data with Facebook ads is a way to take detailed contact information and use it for in-depth ad building, carefully selecting targeting options for Facebook Custom Audiences. A recent article from ActiveCampaign proposes a brilliant way of using timing (and human behavior) as an advantage – and it fits right in with our Facebook integration as well! Their brilliant idea involves a method for using weather forecast data from Darksky – through Heroku – with ActiveCampaign for targeting prospects based on their current location’s weather forecast. Based on parameters you set (likely related to whatever product/service you’re offering), campaigns can be triggered automatically if certain weather forecast conditions are met. That means, for a basic example, being able to advertise your umbrellas to an area about to receive torrential rain. Or, in a more sophisticated use, sending out specific advertising messages and coupon codes on days when people are more likely to be inside and looking at their phones or computers (say, in particularly cold temperatures or during a snow storm). 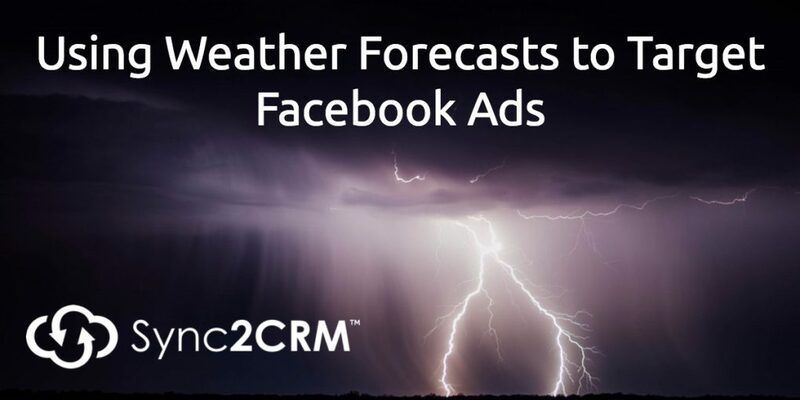 With Sync2CRM, we can take this idea yet another step further, and get these same weather-specific messages into highly targeted (and retargeted) Facebook ads as well. This reinforces the message, and gives prospects more chances to engage. Think about the level of personalization this can offer! Not only are your Facebook Custom Audiences already targeted by segment, interest, region, etc. – now you can create Facebook ads with offers specific to a prospect’s real time experience! Does The Weather Really Impact Us? The weather has an effect on the time people spend on social media (as mentioned above), but it also has a direct effect on the products and services people are looking to purchase on a given day. It may be as simple as sunglasses on a blazing summer day, or something less obvious like living room furniture on wintry days. Weather affects mood and the way people think, so even semi-unrelated products and weather conditions can be associated in people’s minds. Reactions can even depend on region – as people in typically rainy places (like say, Seattle or London) will all but abandon social media on sunny days, and people in the southern United States have a tendency to overreact to snowfall. There’s plenty of room to be creative here! In something of an oxymoron, this is actually a way to use big data, automation, and cutting edge technology to be MORE personal and engaging with the people on your lists. With Sync2CRM, you add another layer of specificity and targeting, using weather forecasts and your existing targeted lists to nail both targeting AND timing. Just another way you can boost your specificity and make your marketing even more powerful! Want to keep your CRM data synced with Facebook Custom Audiences for highly targeted ads that complement your email campaigns? Click here to get a free 30 day trial of Sync2CRM!